We Rock for Autism proudly hosts our annual Concert for Acceptance every April to honor autism awareness month. Gigi’s Music Cafe in Sunrise, FL has provided their amazing venue each year for the concert. The Concert for Acceptance features local singer songwriters, music therapy demonstrations, guest speakers, raffles and silent auctions. Each year the event has been growing due to our amazing supporters and talented performers. Sponsors for prior events have included Southwest Airlines, Disney World, Miami Dolphins, Miami Marlins, Florida Panthers, Busch Gardens, Total Wine & More, University of Miami Athletics, Kilwin’s of Coral Springs, Chocolate Spectrum, Rock Paper Purses, Miami is Kind, Can’t Lose Leatherworks, Badfellow Tattoo, iFly – Fort Lauderdale, Funky Buddha Brewery, Monster Mini Golf and more. Auction and raffle items have included airline tickets, Disney passes, a Bahama’s vacation, wine classes, chocolate baskets, sports memorabilia, music memorabilia and more. Check out some pictures from prior events, and we hope to see you at the next one. We Rock for Autism hosts Autism Friendly Events throughout South Florida. These events are designed to allow families that have children with autism the chance to get out and enjoy various activities. There have been autism friendly movie screenings and painting events. We are always looking to add more, so if you have a business or an idea that your would like to include, let us know. 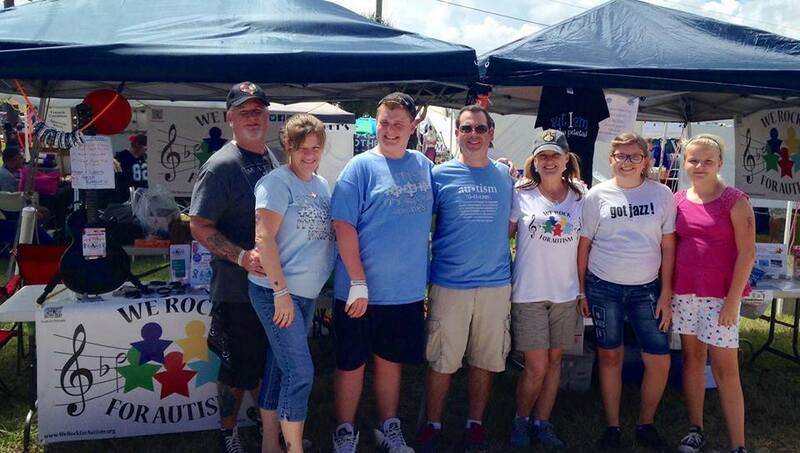 We Rock for Autism has been attending the 80’s in the Park festival since 2014. Each year this festival brings some of the biggest and best bands from the 80’s to Melbourne, FL for a weekend of music and fun. We Rock for Autism brings a new guitar each year to the event and has as many bands as possible sign the guitar. Then, after the event, the guitar is auctioned off online and all of the proceeds go to assisting children on the spectrum. Who has signed…? Well, just to name a few… Quiet Riot, Stryper, George Lynch, Lynch Mob, Tuff, Bullet Boys, Slaughter, Great White, Femme Fatale, Kix, L.A. Guns, Every Mother’s Nightmare, Junkyard, Lillian Axe, Don Jamieson, and more. Check out the pictures! We Rock for Autism hosts Tattoos for Autism with Bobby Badfellow of Badfellow Tattoo in Fort Lauderdale. Autism Awareness and traditional tattoos are available and a portion of all proceeds helps benefit We Rock for Autism. Here are some cool pictures from some of the concerts and events We Rock for Autism has attended. These include live shots of some of the bands, festival pics and supporters!